American Reform rabbi, editor, and author; born at Steingrub, Bohemia, March 29, 1819; died at Cincinnati, Ohio, March 26, 1900. He was the son of Leo Wise, a school-teacher, and received his early Hebrew education from his father and grandfather, later continuing his Hebrew and secular studies in Prague. He received the hattarat hora'ah from the Prague bet din, composed of Rabbis Rapoport, Samuel Freund, and E. L. Teweles. In 1843 he was appointed rabbi at Radnitz, Bohemia, where he remained for about two years, emigrating to the United States in 1846. He arrived in New York on July 23 of the same year, and in the following October was appointed rabbi of the Congregation Beth-El of Albany, New York. He soon began agitating for reforms in the service, and his was the first Jewish congregation in the United States to introduce family pews in the synagogue. Sermons in the vernacular, a mixed choir, and confirmation were also among the innovations introduced by Wise, who even went so far as to count women in forming a minyan or religious quorum. 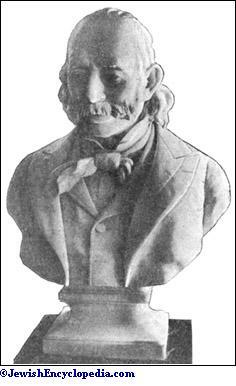 In 1850 some unfortunate events caused a split in the Albany community, and the consequent formation of a new congregation, the Anshe Emeth, by the friends and supporters of the rabbi. Wise remained with this congregation until April, 1854, when he became rabbi of the Bene Yeshurun congregation of Cincinnati, Ohio, where he officiated for the remaining forty-six years of his life. Wise was active in so many directions, and was so great a power in the history of Judaism in the United States, that it is necessary to treat under distinct headings the various achievements of his long and successful career. He was above all an organizer, and the numerous institutions that he called into being attest to the great influence he wielded during his life. In 1847, at the suggestion of Max Lilienthal, who was at that time stationed in New York, a bet din was formed, which was to act in the capacity of an advisory committee to the congregations of the country, without, however, exercising hierarchic powers. As members of this bet din, Lilienthal named Wise and two others, besides himself. At a meeting held in the spring of 1847 Wise submitted to the bet din the manuscript of a prayer-book, to be entitled the "Minhag America," and to be used by all the congregations of the country. He had noticed that nearly every prominent rabbi in Europe, and, later, in the United States, issued his own prayer-book, and in order to stem this individualistic tide he advocated the adoption of a common prayer-book. Nothing definite was done in the matter, however, until the Cleveland Conference of 1855, when a committee consisting of Wise, Rothenberg, and Kalisch was appointed to edit such a prayer-book. This book appeared under the title "Minhag America," and was practically Wise's work; it was adopted by most of the congregations of the Western and Southern states. So pronounced was Wise's desire for union, that when in 1894 the "Union Prayer-Book" was published by the Central Conference of American Rabbis, he voluntarily retired the "Minhag America" from his own congregation. As early as 1848 Wise issued a call to the "ministers and other Israelites" of the United States, urging them to form a union which might put an end to the prevalent religious anarchy. His call appeared in the columns of the "Occident," and was ably seconded by its editor, Isaac Leeser. Wise suggested that a meeting be held in the spring of 1849 at Philadelphia, to establish a union of the congregations of the entire country. This meeting did not take place; but the originator of the idea never ceased advocating it, especially after he had established his own newspaper, "The Israelite" (July, 1854), in the columns of which he indefatigably expounded his views upon the subject. His persistence won its reward when in 1873, twenty-five years after he had first broached the idea, the Union of American Hebrew Congregations was organized at Cincinnati. (From a bust by Moses Ezekiel in the possession of A. S. Ochs. )Hebrew Union College. Earnest as he was in proclaiming the necessity for union among the congregations, he was equally indefatigable in insisting upon the pressing need of a theological seminary for the training of rabbis for American pulpits. In his "Reminiscences" he gives a vivid picture of the incompetency of many of the men who posed as spiritual guides of the congregations during the early days of his residence in the United States. He had scarcely arrived in Cincinnati when, with his characteristic energy, he set to work to establish a college in which young men could receive a Jewisheducation. He enlisted the interest and support of a number of influential Jews of Cincinnati and adjacent towns, and in 1855 founded the Zion Collegiate Association. The venture, however, proved a failure, and the society did not succeed in opening a college. Nothing daunted, Wise entered upon a literary campaign, and year in and year out he presented the subject in the columns of "The Israelite." His indomitable perseverance was crowned with success when, on October 3, 1875, the Hebrew Union College opened its doors for the reception of students, four of whom were ordained eight years later. 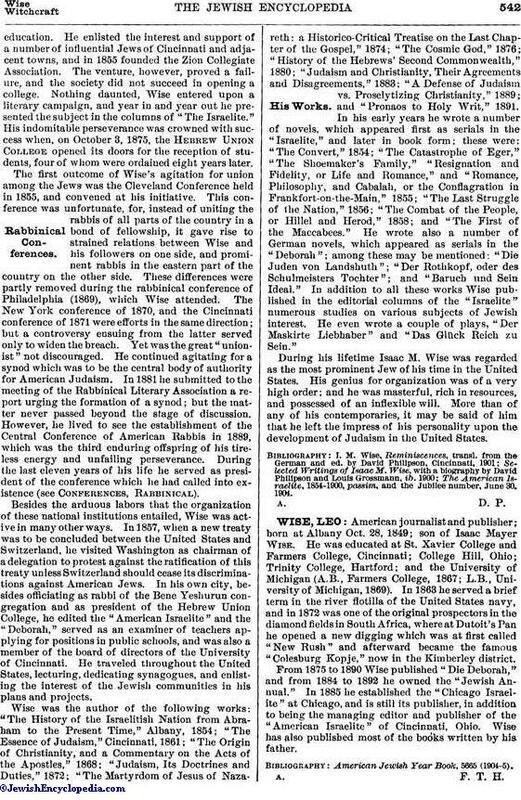 The first outcome of Wise's agitation for union among the Jews was the Cleveland Conference held in 1855, and convened at his initiative. This conference was unfortunate, for, instead of uniting the rabbis of all parts of the country in a bond of fellowship, it gave rise to strained relations between Wise and his followers on one side, and prominent rabbis in the eastern part of the country on the other side. These differences were partly removed during the rabbinical conference of Philadelphia (1869), which Wise attended. The New York conference of 1870, and the Cincinnati conference of 1871 were efforts in the same direction; but a controversy ensuing from the latter served only to widen the breach. Yet was the great "unionist" not discouraged. He continued agitating for a synod which was to be the central body of authority for American Judaism. In 1881 he submitted to the meeting of the Rabbinical Literary Association a report urging the formation of a synod; but the matter never passed beyond the stage of discussion. However, he lived to see the establishment of the Central Conference of American Rabbis in 1889, which was the third enduring offspring of his tireless energy and unfailing perseverance. During the last eleven years of his life he served as president of the conference which he had called into existence (see Conferences, Rabbinical). Besides the arduous labors that the organization of these national institutions entailed, Wise was active in many other ways. In 1857, when a new treaty was to be concluded between the United States and Switzerland, he visited Washington as chairman of a delegation to protest against the ratification of this treaty unless Switzerland should cease its discriminations against American Jews. In his own city, besides officiating as rabbi of the Bene Yeshurun congregation and as president of the Hebrew Union College, he edited the "American Israelite" and the "Deborah," served as an examiner of teachers applying for positions in public schools, and was also a member of the board of directors of the University of Cincinnati. He traveled throughout the United States, lecturing, dedicating synagogues, and enlisting the interest of the Jewish communities in his plans and projects. Wise was the author of the following works: "The History of the Israelitish Nation from Abraham to the Present Time," Albany, 1854; "The Essence of Judaism," Cincinnati, 1861; "The Origin of Christianity, and a Commentary on the Acts of the Apostles," 1868; "Judaism, Its Doctrines and Duties," 1872; "The Martyrdom of Jesus of Nazareth: a Historico-Critical Treatise on the Last Chapter of the Gospel," 1874; "The Cosmic God," 1876; "History of the Hebrews' Second Commonwealth," 1880; "Judaism and Christianity, Their Agreements and Disagreements," 1883; "A Defense of Judaism vs. Proselytizing Christianity," 1889; and "Pronaos to Holy Writ," 1891. In his early years he wrote a number of novels, which appeared first as serials in the "Israelite," and later in book form; these were: "The Convert," 1854; "The Catastrophe of Eger," "The Shoemaker's Family," "Resignation and Fidelity, or Life and Romance," and "Romance, Philosophy, and Cabalah, or the Conflagration in Frankfort-on-the-Main," 1855; "The Last Struggle of the Nation," 1856; "The Combat of the People, or Hillel and Herod," 1858; and "The First of the Maccabees." He wrote also a number of German novels, which appeared as serials in the "Deborah"; among these may be mentioned: "Die Juden von Landshuth"; "Der Rothkopf, oder des Schulmeisters Tochter"; and "Baruch und Sein Ideal." In addition to all these works Wise published in the editorial columns of the "Israelite" numerous studies on various subjects of Jewish interest. He even wrote a couple of plays, "Der Maskirte Liebhaber" and "Das Glück Reich zu Sein." 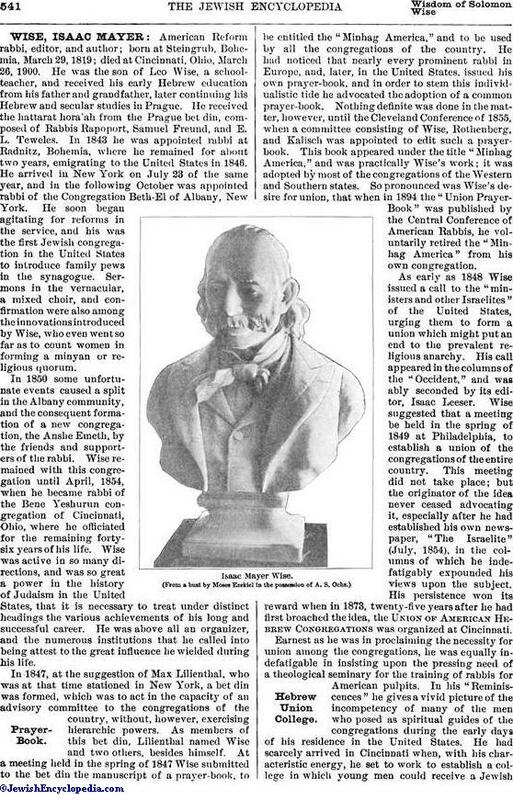 During his lifetime Isaac M. Wise was regarded as the most prominent Jew of his time in the United States. His genius for organization was of a very high order; and he was masterful, rich in resources, and possessed of an inflexible will. More than of any of his contemporaries, it may be said of him that he left the impress of his personality upon the development of Judaism in the United States. The American Israelite, 1854-1900, passim, and the Jubilee number, June 30, 1904.